Did you know Rosewood is home to eight parks? That’s almost 15% of all the parks in the City of Columbia! Click on a name below to find more about that park. Click on the map at right to see all the parks in Rosewood. Click any picture to load directions to that park. Owens Field Park is our biggest and most used park, with over 60 acres of soccer fields and green space, a skate park, wooded walking trails, a fruit orchard, and a disc golf course. The park is adjacent to football, baseball, and softball stadiums, and a track, all owned by Richland County School District One. Owens Field Park sits on land that was once the City of Columbia’s Owens Field Airport. Today, you can still watch as planes takeoff and land at the current airport across the street. Rosewood Park, on South Holly, boasts almost seven acres of green space, with two playground structures, swings, benches and tables, a baseball diamond, and a basketball court. This central Rosewood park has recently seen a number of new additions and renovations. Learn more about those renovations here. Valencia Park is Rosewood’s bustling baseball park. In addition to hosting spring baseball and t-ball games, this recently renovated S. Kilbourne park features playground equipment and green space. Click here for more information on the renovations. Edisto Discovery Park and Neighborhood Center is home to a new community center, a basketball court, playground equipment, and Rosewood’s only spray pool (during summer months). McClinton Park is Rosewood’s smallest park, with swings, benches, and a playground structure for two- to five-year-olds. Bates Park is a beautiful five acres of mature oak trees and green space. Dogs are welcome here (and at all of our parks). We’re proud of our parks and want to keep them clean, so please clean up after your dog and remember, you must keep your dog on a leash! 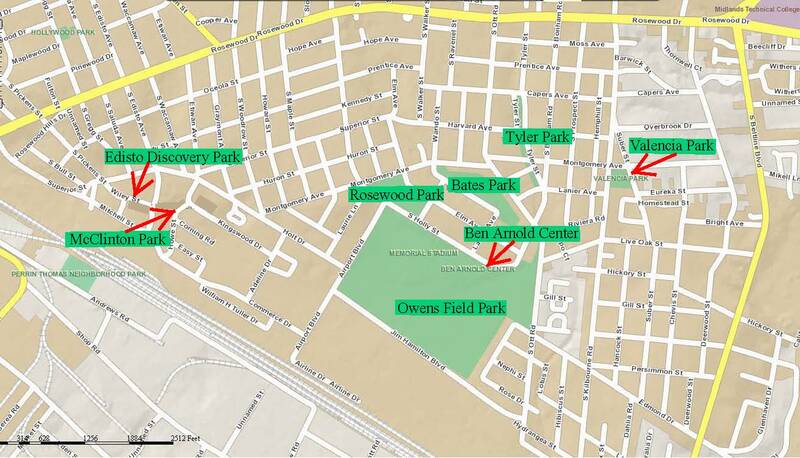 Tyler Park is Rosewood’s most unusually shaped park, featuring three acres of green space and spanning four cross streets as it winds down Tyler Street. The Ben Arnold Center is a local branch of the Boys and Girls Club of the Midlands. The Center has an outdoor playground and swings that families in the neighborhood are welcome to enjoy. One of Rosewood’s community gardens is located behind the Ben Arnold Center. The property borders a Richland One baseball field and backs up to the walking trails of Owens Field Park. Find more information from the City of Columbia about all the city parks here.